Romantic, delicate and classic. 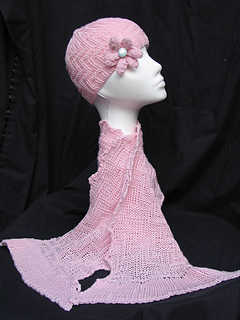 This pattern comes with instructions for a hat, reversible scarf and six-petal flower. The stitch pattern is a 16 row repeat of a simple knit/purl combination. It is reversible (identical on both sides). The sample shown is in Plymouth Yarn’s Super Taj Mahal (70% superfine merino wool, 12% silk, 8% cashmere).